broom and mop handles, brush backs and metal handles, compared to the first half of 2017. For June 2018, all four categories also reported decreases: hog bristle, broom and mop handles, brush backs and metal handles, compared to June 2017. Import totals for the first half of 2018 were up in four finished goods categories outlined: toothbrushes, paint rollers, paintbrushes and upright brooms, compared to the first half of 2017. In June 2018, five categories outlined recorded increases: toothbrushes, shaving brushes, paint rollers, paintbrushes and upright brooms, compared to June 2017. 63 percent from 27,949 kilograms imported in June 2017. During the first half of 2018, 86,893 kilograms of hog bristle were imported, down 49 percent from 169,645 kilograms imported during the first half of 2017. The average price per kilogram for June 2018 was $42.89, up 27 percent from the average price per kilogram for June 2017 of $33.77. The average price per kilogram for the first half of 2018 was $34.15, up 40 percent from the average price per kilogram of $24.37 for the first half of 2017. The import total of broom and mop handles during June 2018 was 1.1 million, down 21 percent from 1.4 million for June 2017. During the first half of 2018, 8.7 million broom and mop handles were imported, down 3 percent from 9 million for the first half of 2017. During the first half of 2018, the United States received 3.8 million broom and mop handles from Honduras, 2.6 million from Brazil and 1.7 million from China. The average price per handle for June 2018 was 71 cents, down 12 percent from 81 cents for June 2017. The average price for the first half of 2018 was 73 cents, down 11 percent from 82 cents for the first half of 2017. June 2018 imports of brush backs totaled 490,545, down 21 percent from 623,174 for June 2017. 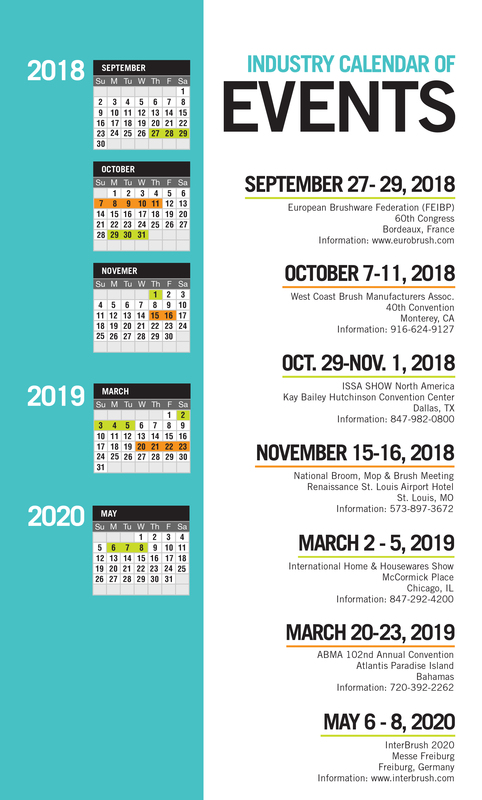 During the first half of 2018, 2.7 million brush backs were imported, down 4 percent from 2.8 million for the first half of 2017. Sri Lanka shipped 1.2 million brush backs to the United States during the first half of 2018, while Canada sent 1.1 million. The average price per brush back was 48 cents during June 2018, up 17 percent from 41 cents for June 2017. For the first half of 2018, the average price per brush back was 50 cents, down 1 cent from the average price for the first half of 2017. During the first half of 2018, Italy exported 4.7 million metal handles to the United States, while China sent 3.9 million and Spain shipped 2.1 million. The average price per handle for June 2018 was 92 cents, up 26 percent from 73 cents for June 2017. The average price for the first half of 2018 was 94 cents, up 9 percent from 86 cents for the first half of 2017. The United States imported 666,961 brooms of broom corn valued at more than 96 cents per broom during June 2018, down 9 percent from 732,281 for June 2017. During the first half of 2018, 3.2 million brooms of broom corn were imported, down 11 percent from 3.6 million for the first half of 2017. The average price per broom for June 2018 was $2.34, down 5 percent from $2.47 for June 2017. The average price per broom for the first half of 2018 was $2.41, up 1 percent from the average price for the first half of 2017 of $2.38. The import total of brooms and brushes of vegetable material during June 2018 was 216,158, down 34 percent from 329,513 brooms and brushes imported during June 2017. During the first half of 2018, 1.3 million brooms and brushes were imported, down 13 percent from 1.5 million for the first half of 2017. 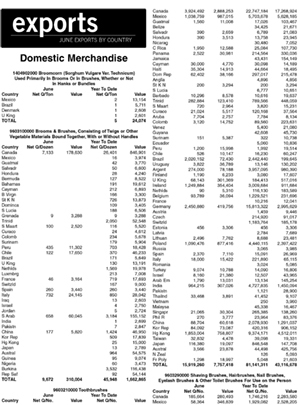 Sri Lanka exported 738,319 brooms and brushes to the United States during the first half of 2018, while China sent 307,000. The average price per unit for June 2018 was $1.22, up 1 cent from the average price for June 2017. The average price for the first half of 2018 was $1.13, down 23 percent from $1.46 for the first half of 2017. The average price per toothbrush for June 2018 was 23 cents, the same as the average price for June 2017. The average price for the first half of 2018 was 24 cents, up 9 percent from 22 cents for the first half of 2017. June 2018 imports of hairbrushes totaled 3.8 million, down 21 percent from 4.8 million for June 2017. During the first half of 2018, 23.6 million hairbrushes were imported, down 4 percent from 24.5 million for the first half of 2017. The average price per hairbrush was 29 cents during June 2018, up 7 percent from the average price for June 2017 of 27 cents. For the first half of 2018, the average price per hairbrush was 25 cents, up 1 cent from the average price for the first half of 2017. The United States imported 6.9 million shaving brushes in June 2018, up 130 percent from 3 million imported in June 2017. During the first half of 2018, 26.3 million shaving brushes were imported, down 6 percent from 28 million imported during the first half of 2017. The average price per shaving brush for June 2018 was 11 cents, down 45 percent from 20 cents for June 2017. The average price for the first half of 2018 was 14 cents, down 1 cent from the average price for the first half of 2017. The import total of paint rollers during June 2018 was 8.8 million, up 49 percent from 5.9 million for June 2017. During the first half of 2018, 42.8 million paint rollers were imported, up 23 percent from 34.9 million during the first half of 2017. The average price per paint roller for June 2018 was 37 cents, down 24 percent from 49 cents for June 2017. The average price for the first half of 2018 was 42 cents, down 1 cent from the average price for the first half of 2017. U.S. companies imported 28.3 million paintbrushes during June 2018, up 11 percent from 25.5 million for June 2017. Paintbrush imports for the first half of 2018 were 158.8 million, up 20 percent from 132.7 million for the first half of 2017. China shipped 143.1 million paintbrushes to the United States during the first half of 2018. The average price per paintbrush for June 2018 was 28 cents, up 1 cent from the average price for June 2017. The average price for the first half of 2018 was 27 cents, down 7 percent from 29 cents for the first half of 2017. The total import of upright brooms for June 2018 was 1.7 million, up 6 percent from 1.6 million for June 2017. During the first half of 2018, 9 million upright brooms were imported, up 10 percent from 8.2 million imported during the first half of 2017. The average price per broom for June 2018 was $1.30, up 17 percent from $1.11 for June 2017. The average price per broom for the first half of 2018 was $1.36, up 11 percent from $1.22 for the first half of 2017. In June 2018, three categories reported increases, compared to June 2017: toothbrushes, shaving brushes and paintbrushes. The United States sent 26,401 dozen brooms and brushes to Canada, during the first half of 2018. During June 2018, the United States exported 15.9 million toothbrushes, up 53 percent from 10.4 million for June 2017. During the first half of 2018, 81.1 million toothbrushes were exported, up 14 percent from 71 million exported during the first half of 2017.
to Germany, during the first half of 2018. The average price per toothbrush for June 2018 was 49 cents, down 18 percent from 60 cents for June 2017. The average price per toothbrush for the first half of 2018 was 53 cents, down 5 percent from the average price for the first half of 2017 of 56 cents. During the first half of 2018, the United States exported 5.1 million shaving brushes to Brazil, 1.9 million to Mexico and 1.7 million to Canada. The average price per shaving brush for June 2018 was 86 cents, down 40 percent from $1.43 for June 2017. The average price for the first half of 2018 was $1.03, down 7 percent from the average price for the first half of 2017 of $1.11. June 2018 exports of artist brushes totaled 891,631, down 36 percent from 1.4 million for June 2017. During the first half of 2018, 5.7 million artist brushes were exported, up 19 percent from 4.8 million for the first half of 2017. The export total of paintbrushes during June 2018 was 226,043, up 37 percent from 165,349 for June 2017. During the first half of 2018, 1.2 million paintbrushes were exported, the same as for the first half of 2017. Canada imported 613,097 paintbrushes from the United States during the first half of 2018, while the United Kingdom received 240,181. The average price per paintbrush for June 2018 was $6.26, down 12 percent from $7.14 for June 2017. The average price for the first half of 2018 was $6.99, up 7 percent from $6.54 for the first half of 2017. 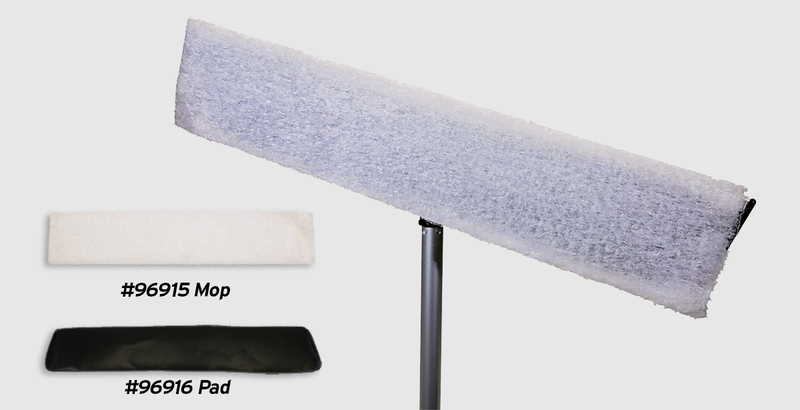 • Use with 96916 pad to attach to any Velcro® mop frame. 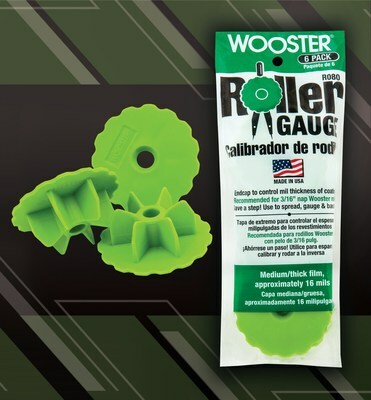 “The Wooster Brush Company has added a green 16mm-roller gauge to extend the product line of the roller gauge system. These tools make a challenging application — controlling mil thickness — instantly more precise,” according to Wooster. The design helps with spreading, gauging, and back-rolling roof and floor coatings, epoxies, urethanes, anti-skid floor toppings, metallic finishes and vapor barriers. nap Wooster roller covers. Wooster said using different nap height covers will provide varying results. Wooster Brush Company was established in 1851. Based in Wooster, OH, the privately held company, with 585 employees, produces more than 2,000 products for both professional and DIY painters. For more information, visit woosterbrush.com. 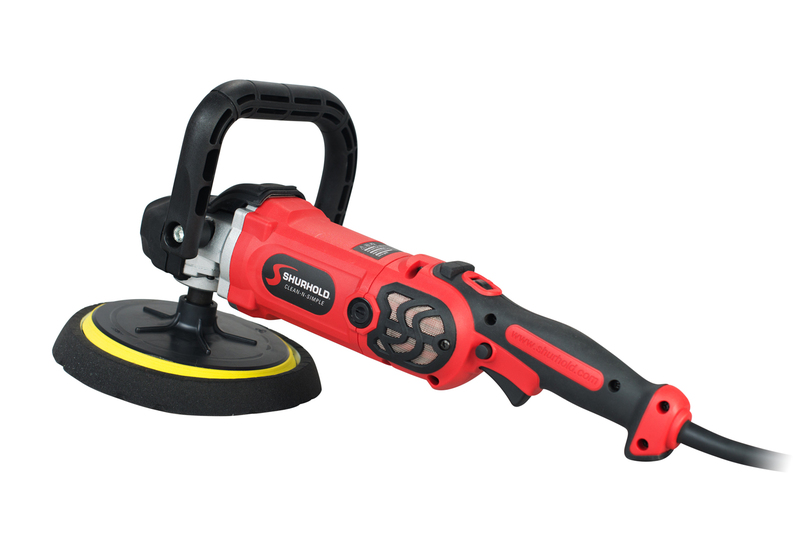 “Shurhold Industries' Pro Rotary Polisher is engineered to deliver rugged, all-day dependability and results. It cuts through oxidation, and corrects surface scratches and imperfections,” said the company. It has three different right- or left-hand ergonomic grip styles for comfortable, extended use. A soft-start power switch avoids a jarring torque. A locking-on-button and thumb-controlled variable-speed dial make it easy to select from 600–3,200 rpm. A 20-foot cord provides project mobility. The Pro Rotary Polisher features a 7-foot quick change backing plate. It makes switching between polishing, waxing and buffing pads fast and easy. Professional grade, the Pro Rotary Polisher has EZ Change carbon high-resistance brushes. Large, removable screened vents deliver massive air flow to keep the motor cool for a long service life. A video can be viewed at bit.ly/2w140Vn. It comes with a canvas storage bag, replacement brushes, tool, detailed instruction manual and one-year limited warranty. For more information, visit www.shurhold.com/auto.